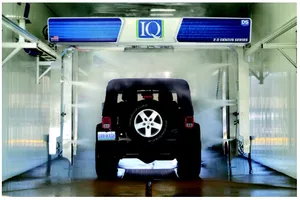 D&S Car Wash Equipment Company announced that its IQ model in-bay automatic car wash system reached 10 million cumulative washes delivered among its worldwide customer base. The first two IQ’s were installed in the summer of 2011 at Hurricane Bay Car Wash in Ozark, MO and at Luv Bugs Car Wash in Dade City, FL. Both machines are still going strong and nearing 100,000 washes each. “The IQ was developed as a highly intelligent platform, including its sophisticated performance tracking capabilities,” said Jerry Canfield, the firm’s chief innovation officer. “Being able to monitor and track all facets of equipment activity provides owners and our tech support team with important real time information.” The current version is the IQ 2.0, and is offered in a touch-free and soft-touch format.